The summer has arrived. Now, if you are looking to create a cold storage, and have a shipping container lying around, this “how-to” might be for you! 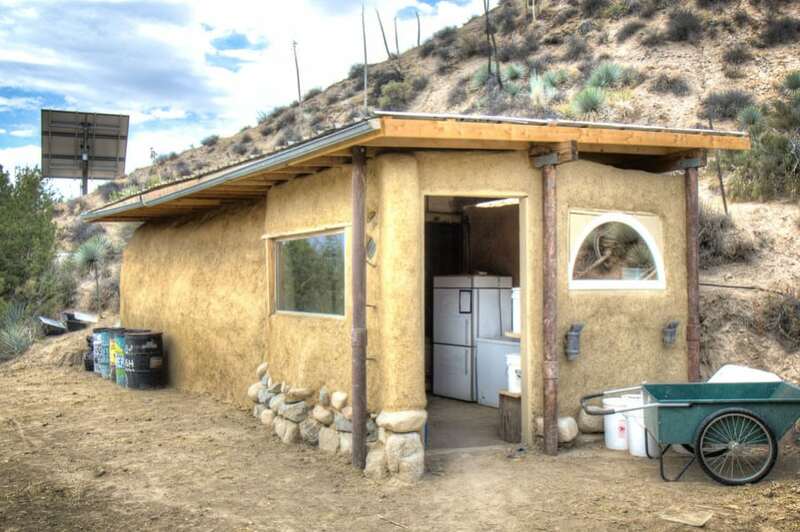 This method takes advantage of some serious thermal mass (for instance, 3′ deep in the earth at our site the temperature is a stable 65 degrees), a fancy optional venting system, and light clay straw as insulation (straw covered in a wet clay slip). It is not advisable to bury a container outright; they are only weight bearing on the four corners. Orient shipping container against a hillside. *Optional – create vents: vertically against the hillside of the container, align metal pipes with the fork tubes (normally two spaces underneath the container for fork lifts), cut out openings on the floor of the container that correspond for the fork tubes (about 1 square foot), weld rebar to make a grate for these openings. These pipes and openings become the cold air input; a drip line on Saltillo tiles behind the top of the vertical pipes will create an even colder input. Backfill any space against the hill with fill dirt. Use cob toward the top and build a wall some inches higher than the container to hold a beam (cob – mixture of clay/sand/straw). Place all-threads or rebar into this wall to hold the beam in place. In areas with substantial rain, consider making a French drain using gravel to prevent rapid rusting of the container. On the other long side of the container, build a massive cob wall (something like 3′ wide) that tapers toward the top. This is a lot of cob – advisable to use a tractor if available. Raise this wall higher than the container, but at least 3″ lower than the hillside wall to ensure drainage away from the structure. Place all-threads or rebar through the top of this wall as well to hold a beam. Place beams on top of each wall long enough to hold a roof that protects against the sun and rain. Connect the beams with rafters and purlins or plywood. Infill with light clay straw insulation before finishing the structure with roofing. *Optional – a whirlybird through the ceiling and roof can help release any warm air, and pull more cold through the vents. *Optional – build a buffer room off of the entrance.